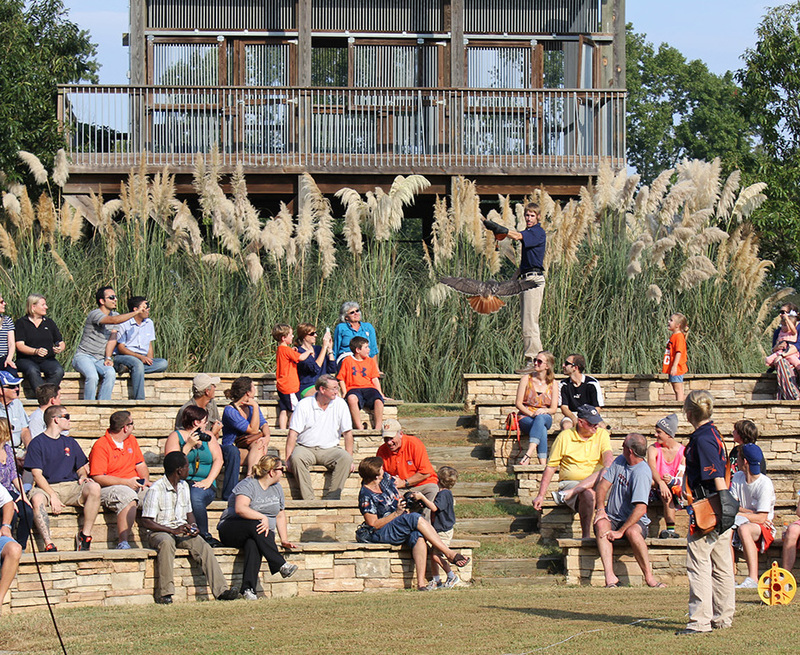 One of Auburn University’s most popular fall programs returns to offer fans the opportunity to see a raptor show and flight demonstration — the Southeastern Raptor Center’s Football, Fans and Feathers educational programs will be held each Friday before home football games. This year, seven shows will coincide with home football games, giving fans the opportunity to learn about education, conservation and rehabilitation of injured birds of prey and see them in flight. Shows will be held Sept. 1, 15, 29; Oct. 6 and Nov. 10, 17 and 24. No post-season shows are scheduled. Tickets are $5 per person (children under three admitted free) for the hour-long program, which begins at 4 p.m. at the center’s the 350-seat Edgar B. Carter Educational Amphitheater, located at 1350 Pratt-Carden Drive off Shug Jordan Parkway. Reservations are not required. Refreshments will be sold. 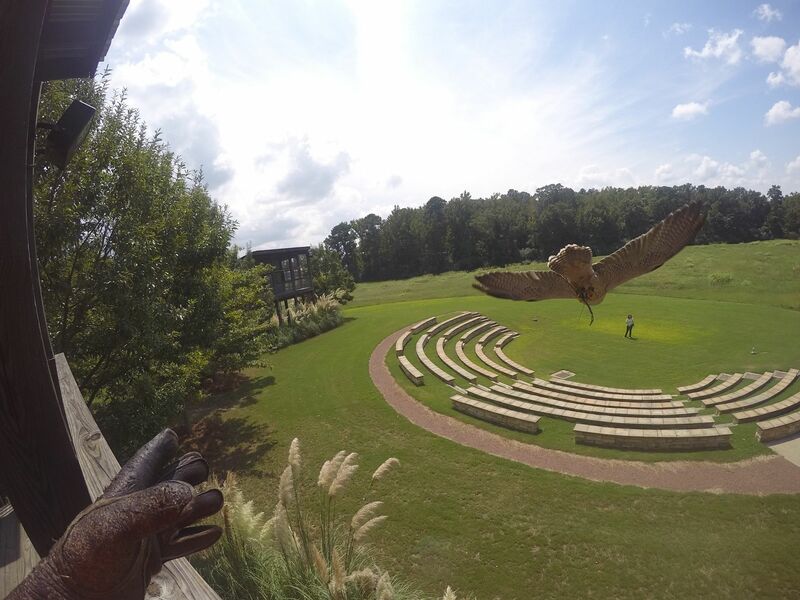 During the show, hawks, falcons, eagles and other birds of prey are free-flown from towers and around the amphitheater, enabling visitors to see these raptors flying close. The programs are delivered by raptor specialist Andrew Hopkins, who is assisted by staff and volunteers of the Southeastern Raptor Center. All birds used in the programs are permanent residents that are non-releasable due to prior injuries or human imprinting. The Southeastern Raptor Center is a division of the Auburn University College of Veterinary Medicine. The center is closed to the public except for specific dates. For group private tours, or for more information about Football, Fans and Feathers, call 334/844-6943. The mission of the Southeastern Raptor Center is rehabilitation of injured or orphaned raptors and to educate the public about birds of prey. For more information, visit www. auburn.edu/raptor. Shows will be held Sept. 1, 15, 29; Oct. 6 and Nov. 10, 17 and 24. Note: For GPS, use 1350 Raptor Road. Roadside signs on Shug Jordan Parkway mark the program’s location on the day of each show. Pratt-Carden Drive is located off Shug Jordan Parkway just north of the Wire Road intersection.